Filling out your 2019 NCAA bracket can be a major challenge. Which underdog will make a deep March Madness run? Can Zion Williamson lead Duke to its sixth national title? 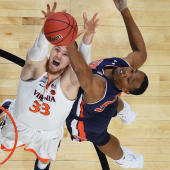 Will Virginia make history again after falling as a 1-seed last year? These are just a few of the questions fans around the country are asking themselves while locking in their final 2019 March Madness bracket picks before Louisville and Minnesota tip at 12:15 p.m. ET on Thursday. There's plenty to consider too. Over the last eight years, a 7-seed or lower has made it all the way to the Elite Eight. And when it comes to the national championship, which takes place on April 8, a top-three seed has won 19 of the last 20 times. With a deep field of extremely talented teams in the 2019 NCAA Tournament field like North Carolina, Michigan, Tennessee, and Purdue, some data-driven help can certainly go a long way in helping you create the best possible NCAA bracket 2019. That's why you need to see the 2019 NCAA Tournament brackets and March Madness picks from SportsLine's proven computer model. There's simply no reason to rely on luck when there's proven technology to help you dominate your 2019 NCAA Tournament pools. Now, the model has simulated every possible matchup in the 2019 NCAA Tournament and revealed its optimal bracket. You can only see it over at SportsLine. If you're looking for a pick that will give you a huge edge in your 2019 March Madness bracket, SportsLine's model says you should back No. 5 Marquette with confidence. Look for the Golden Eagles to bounce back from a tough end of the season to make a Sweet 16 run. Sixteen years after Dwyane Wade led Marquette to the Final Four with a miraculous NCAA Tournament performance, the Golden Eagles have another superstar guard they'll be leaning on heavily. Markus Howard was the 2018-19 Big East Player of the Year after averaging 25.0 points per game and will be key to Marquette's success in the NCAA Tournament 2019. Howard dropped 53 points in an overtime win against Creighton on Jan. 9 and also had 45-point performances in wins over Buffalo and Kansas State, both tournament teams. He's a one-man scoring machine who hit at least five 3-pointers in eight games this season. During his incredible three-year career in Milwaukee, Howard is shooting 43.6 percent from beyond the arc. On Thursday, Howard will face fellow superstar guard Ja Morant of Murray State. Morant is expected to be a top-five pick in the NBA Draft, but the model gives Howard and his supporting staff an edge because of their superior shooting. The Golden Eagles advance in a strong 77 percent of SportsLine's simulations. Another curveball: the No. 9 seed Baylor Bears win the always-tough-to-predict 8 vs. 9 matchup against Syracuse. Baylor suffered a major setback in January when sophomore forward Tristan Clark went down with a knee injury that caused him to miss the rest of the season. Despite losing their top scorer, the Bears went on to finish fourth in the Big 12. And the Bears know what it takes to be successful in the NCAA Tournament, having made the Big Dance in five of the last six seasons. Baylor is a dangerous team loaded with upperclassmen like senior guard Makai Mason, who's averaging 14.6 points and 3.3 assists per game. Mason transferred to Baylor from Yale and has already proven he can play extremely well on the biggest stage. In fact, Mason dropped 31 points in the NCAA Tournament three years ago when 12-seed Yale upset 5-seed Baylor. The Bears will need to get Mason, who knocks down 36.5 percent of his shots from behind the arc, going early against Syracuse's 2-3 zone defense. Moving the ball quickly against the zone will give Mason the open shots he needs to help Baylor pull off the upset. Plus, Syracuse will be without Frank Howard, its starting point guard who was averaging 23 points per game. Howard is suspended for violating an athletic department policy, giving Baylor even more of an edge. That's why SportsLine's advanced computer says you can bank on the Bears to beat Syracuse in over 50 percent of simulations. So who else makes a deep run in the NCAA Tournament? Visit SportsLine now to see which No. 3 seed reaches the Final Four, and see who wins every single game, all from the model that has nailed 12 of the 18 double-digit upsets in the first round the last three years.